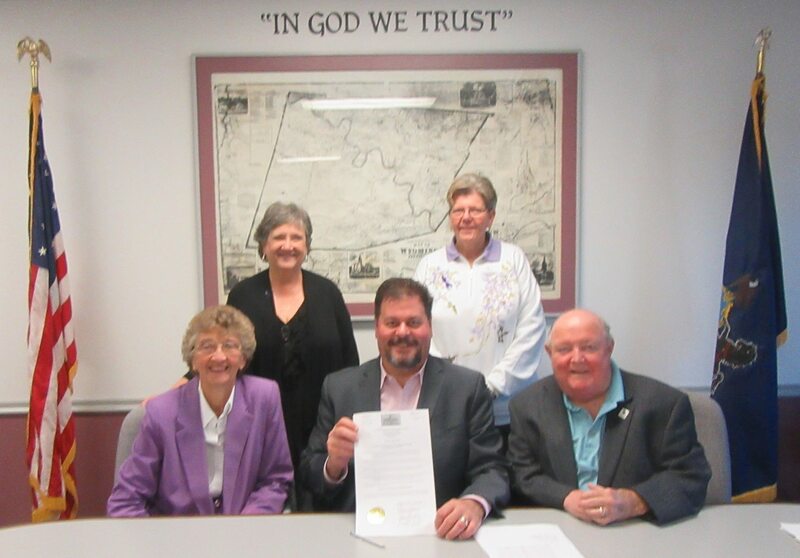 Among other business, the Wyoming County Commissioners (seated, from left) Judy Mead, Tom Henry and Ron Williams declared October as Domestic Violence Awareness Month to the satisfaction of (standing, left) Victims Resource Center executive director Janet MacKay and VRC board member Debra Lozano. Though the printed agenda for the Oct. 18 public meeting of the Wyoming County Commissioners suggested a light and speedy session, a number of interesting topics were brought to the floor, prompting action on some and tabling of others. At the request of Wyoming County Elections Supervisor Florence Ball, the county commissioners unanimously agreed to the placement of signage at polling sites throughout the county forbidding the use of cell phones and cameras near the polling machines. Commissioner Ron Williams noted that there is a voting machine in the lobby of the courthouse with a sample ballot on it. “They can come and take pictures of that if they want to,” he joked. The commissioners were in agreement on the issue, but did not know yet how the signs would be worded. Henry suggested that the signage should be sufficient to prevent such actions. Rick Wilbur, a poll watcher, indicated that it has been common practice in the past for poll watchers to call voters from the inside of the polling place. The commissioners took note and agreed that poll watchers should go outside to use their phones. County residents accustomed to paying taxes and fines or purchasing dog licenses and gun permits at the courthouse with plastic can expect an added surcharge. A measure approved by the board on Tuesday includes a 2.6 percent increase for those using credit cards and 1.5 percent for those using debit cards. Credit card companies have raised their fees, Henry explained, and this was the fairest way to pass the increase on to those using plastic rather than burdening tax payers in general. County solicitor Paul Litwin reported that he was close to completing modifications to a sales agreement between the county and Nimble Hill Winery owner Gary Toszko for the property along Route 6 east of town where the prisoner wood yard was located. Toszko is paying $340,000 for the parcel on which he reportedly intends to expand his winery and brewery business from across Route 6 and make it more of a visitor destination. Moving the wood yard, where fortunate Wyoming County inmates have an opportunity to earn some money to pay fines by cutting firewood, cost the county approximately $14,000. Work included surface preparation and other infrastructure like electricity and water. Henry credited county emergency coordinator Gene Dziak and a number of prisoners for saving the county an additional $9,000 by moving the final structures from the old site in lieu of having a contractor do it. The costs were somewhat unexpected, Henry related, but fell well within the profit margin for the sale of the property. Commissioner Judy Mead explained that the new wood yard, which is located behind the county EMA center is larger and more accessible to tractor trailers. Henry read portions of letters of gratitude from the Wyoming County Cultural Center and The Oldest House in Laceyville. Both commended the board for recent contributions by the county toward programming and structural rehabilitation, respectively. Oldest House Board member Deborah Courville was pleased to announce that recent donations by Wyoming County and Laceyville Borough have helped the organization achieve its fundraising goals for a major reconstruction of the building’s foundation. Courville noted previously that improper repairs and additions to the foundation, which was begun in the late 1770s, eventually led to it being compromised. A third letter to the board was from the Clinton County Correctional Facility, offering space for outsourced inmates in their 302-bed facility at $70 per day per inmate. “That’s five dollars more than we pay anybody else we use,” Henry remarked. “And a long way to drive,” said Mead. The commissioners agreed that they hoped to never have to take Clinton County up on its offer. Gaylord informed the commissioners that he believes PennDOT is ready to settle on the ownership of Road Side Rest Park in Eaton Township. PennDOT had recently requested a site survey, which the commissioners agreed is likely a prelude to a final deed of conveyance. PennDOT has long maintained the park as its own, even though the county technically owns most of what is perceived as the park and then some. Citizen attendee Lori Bennett asked the commissioners if there had been an official job description released for the new Institutional Probation Officer the county agreed to hire after the emergency prison board meeting of Aug. 24. the commissioners winced at the reality of very few of the promises made to the commissioners and the public that day coming to fruition as quickly as is needed to curb prison overpopulation. They expressed their dissatisfaction with the pace with which Judge Russell Shurtleff is handling the matter and with his placement into the prison system this past week of four people who owed less than $1,200 in child support each. Mead produced copies of the job description but admitted that she did not know for certain if there had been any changes to the document. Janet MacKay and Debra Lozano of the Victims Resource Center came to the meeting to hear Henry read aloud a proclamation declaring October Domestic Violence Awareness Month in Wyoming County. Henry announced with frustration that health insurance costs for the county will go up 10.3 percent next year, resulting in an increase of more than $200,000. He also expressed sadness at the news that Milton Stang, a recent recipient of the commissioners’ “50 Year Voters Citation,” had passed away. Mead was happy to announce that the Boy Scouts had regrouped in the Mehoopany area and are planning a haunted house at the Forkston Grange Building this Friday and Saturday from 6 to 9 pm each night. Cider and snacks will be served. Donations will be accepted. It was noted that there is a Drug Take Back box permanently set up in the courthouse lobby. It is bolted to the wall, under constant surveillance, and emptied daily. “Quite a few people have dropped off drugs already,” said Mead, who will attend a seminar for seniors on Friday about keeping prescription medication out of harm’s way. County Detective David Ide will conduct the event. The board unanimously tabled approval of the Children & Youth Services contracts pending clarification of a service called Vision Quest that all three commissioners were certain had been discontinued. 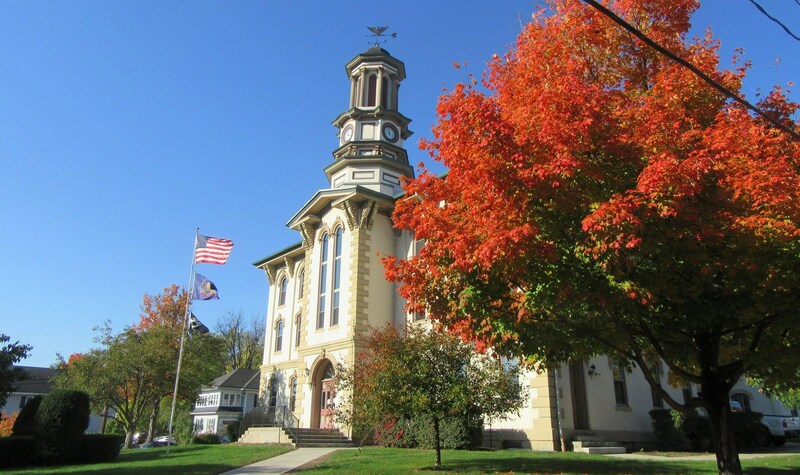 The Wyoming County Commissioners will meet again on Tuesday, Nov. 1 at 9 am at the courthouse in Tunkhannock.